and the visual arts for a number of years, often giving rise to differing opinions. Some see participation as inherently positive, while others question the risk of political instrumentality or the blurring of artistic and social concerns and experiences. Between these polarized reactions lies a rich complexity of artistic choices, forms and experiences that include the audience both conceptually and concretely. 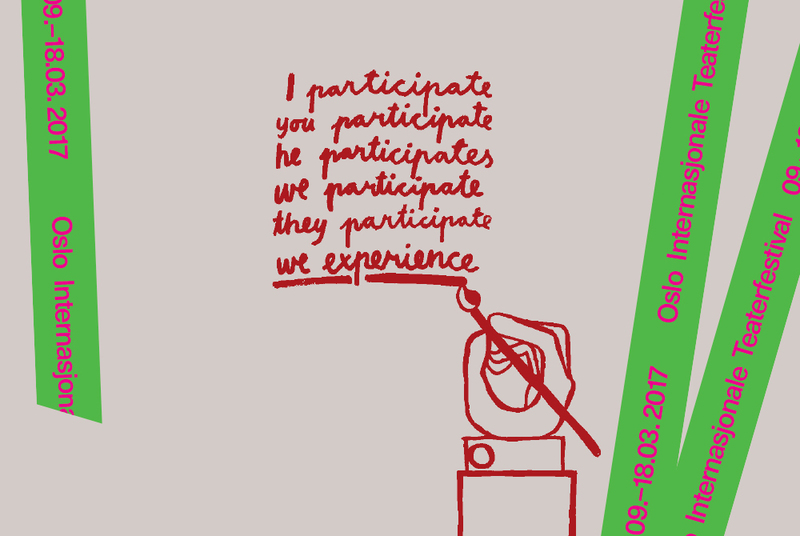 Participation is a vital component to many of the works featured in the festival program. Some works convey the fragility, beauty and messiness of collectivity and cooperation, while in other works participation arises from a set of artistic interests. How can we move beyond polarization and explore artistic approaches to the position and potential of the audience in art and performance? The aim of this Roundtable & Debate is to open a space for this critical exploration. Ine Therese Berg: PhD candidate at the Oslo and Akershus University College of Applied Sciences. The working title of her dissertation is “Social form: Spectatorship and participation in contemporary performance and theory”. Ine has also worked as a critic and with international collaboration and development while with the organization Dance Information Norway. Kate McIntosh: Artist originally from New Zealand and trained in dance, now based in Brussels and working across the boundaries of performance, theatre, video and installation. Since 2004 she has focused on creating her own work but also working in collaborations with artists such as Tim Etchells, Eva Meyer-Keller and Lilia Mestre. Kate is a founding member of SPIN: the artist-run production and research platform based in Brussels. Per Gunnar Eeg-Tverbakk: Artist and curator, and former research fellow at the Oslo National Academy of the Arts. His independent curatorial projects include the 1999 Lofoten International Art Festival (LIAF), the 2004 Momentum – Nordic Biennial for Contemporary Art, and Artistic Interruptions in Nordland 2003-2005. Currently he is working together with Eva González-Sancho on OSLO PILOT, a pilot project for an art biennial in Oslo. Stéphanie Airaud: In charge of mediation, cultural and educational programs at the MAC VAL – Musée d’art contemporain du Val-de-Marne. She is an art historian and holds a Master of Art History and Curatorial Studies from the Sorbonne, and a Master of Museum Studies from the Ecole du Louvre. She develops projects linked to multi-disciplinary formats of transmission that question gesture, writing and orality, as well participation in art community projects. Tormod Carlsen: Artist working in the performing arts who has a strong interest in artistic approaches involving landscapes and context. He has among other things developed a series of one-person theatres and interventions in public spaces. Tormod is an associated artist at Black Box teater. March 18, 14:00-16:00, Black Box teater foyer. Free entrance. The conversation will be in English.